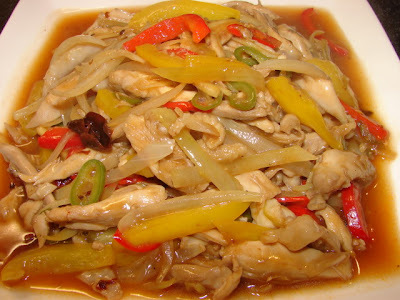 Dong'an Zi Ji is a very famous Hunanese dish, a spicy and vinegary chicken stir fry. Another name is vinegar chicken. This dish dated back to Tang Dynasty over 1000 yrs ago. Here is the story how it was created. "On night a hungry customer walked into a restaurant in Dong'an, being very late almost everything was sold out. The owner tried not to disappoint the customer, he quickly slaughtered a chicken and rustled up a stir fry with whatever food left in the kitchen. A simple unknown chicken dish was born with ginger, spring onion, chillies and plenty of vinegar. The customer really enjoyed the chicken, so this dish soon spread out throughout the surrounding areas. The Mayor of the province soon heard of this and come for a tasting. He really like it too. He then named this dish Dong'an Zi Ji." Now this dish is famous not only in Hunan but throughout China and abroad. No sure if the recipe still remains authentic today as it was years ago. I wonder if bell peppers were available all those years ago, they are commonly included in this dish nowadays. Anyway, enough of history, here is a typical recipe. It's quite simple. This chicken dish is very spicy and tangy, if you don't like too spicy reduce the chillies, ginger and chilli oil, use sparingly. Also if you don't like the sauce too sour reduce the vinegar. * I find wetting the Sichuan peppercorns will release the fragrance more and faster before they get burnt. Put chicken in a saucepan, add enough water to cover. Heat the water till boiling, remove any scum then continue simmer for another 5 minutes. Remove chicken legs, rinse of any scum and put them in cold water to cool down. Then take them out, remove the bones and chicken skin if you like, I like to leave the skin on. Cut the boned chicken into long strips along its grains. If the chicken is not cooked through it does not matter, the following stir frying will finish the cooking. Do not overcooked the chicken during poaching or the meat can be tough after stir frying. Add cooking oil to wok heat to medium hot, add Sichuan peppercorns and fry till oil is fragrant and peppercorns look dark brown. Remove peppercorns. Add dried chillies, they will sizzle then follow by spring onion and ginger. Stir fry till fragrant. Turn the heat on highest add chicken pieces, stir then add some/most of slackened cornflour to coat the chicken, this is to avoid meat juices running out too quickly especially if the wok is not superhot. Then add vinegar and wine stir fry till hot and bubbly then add peppers, fresh chillies and onion. Stir fry till vegetables are slightly softened. Add remaining slackened cornflour if required, stir till sauce is bubbly and thickened. Can add more water if not enough sauce. Season with enough salt, dash of soy sauce/chicken powder, sugar, sesame oil and chilli oil. What a beautiful combination of flavours. Hi Ana, how are you? A little bit late but still Happy New Year to you.